The “yellow vests” movement - named after the fluorescent jackets French motorists have to carry in their vehicles - started in mid-November as a protest against a fuel tax but has since grown into a broader backlash against President Emmanuel Macron’s government. Below is a list of companies which have made statements about how the protests have hit their businesses. Estimated 15 million euro hit to revenues. The airline said it had been impacted by last-minute cancellations of bookings due to the protests. The electronics goods retailer said it had been hit by having to close stores during the protests. No precise figures given. Nevertheless, Richemont said that during the latter part of the fourth quarter, sales in Europe were affected by social unrest in France which negatively impacted tourism and led to store closures for six consecutive Saturdays. No precise figures given. 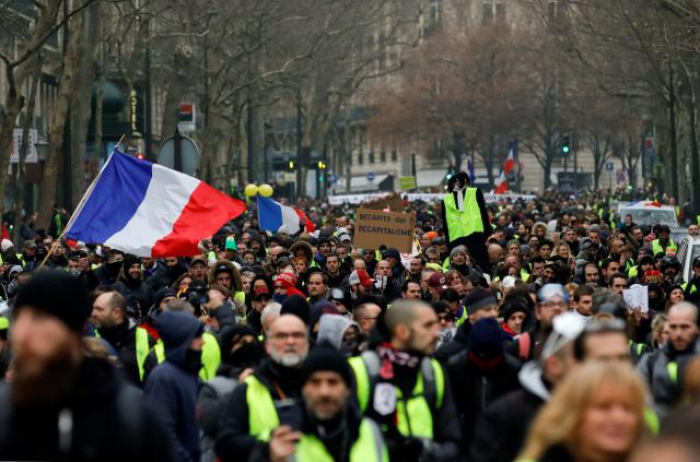 Chief Executive Denis Machuel said the protests had impacted parts of its business exposed to the French tourism sector, although he added that this impact should be “manageable”.